The new US administration is setting out on a collision course with Iran. Team Trump has already imposed new sanctions on Tehran, threatened to rip up the nuclear deal, and accused the country of sponsoring terrorism. As Iran goes ahead with new ballistic missile tests and the tone in Washington grows tougher, is the fragile peace between Iran and the US in jeopardy? And can the hard-fought nuclear deal survive the tensions? 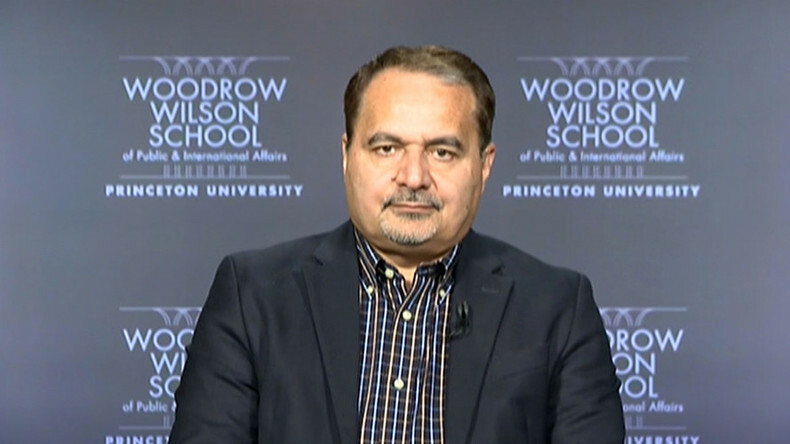 We ask the man who negotiated the agreement for Iran, former head of the Iranian National Security Council’s Foreign Relations Committee and professor at Princeton university – Seyed Hossein Mousavian. Sophie Shevardnadze: Former head of the Foreign Relations Committee of Iran’s National Security Council, spokesman for Iran in its nuclear negotiations, professor at Princeton university - Seyed Hossein Mousavian, it's really great to have you back on our program. Always a pleasure. So, professor, Right after taking office Trump’s administration has imposed new sanctions against Iran for ballistic missile tests and put it ‘on notice’ for destabilising behaviour in the Middle East - Is the American-Iranian detente over? Seyed Hossein Mousavian: I don't believe so. I would not really judge Trump's Iran policy based on one sanctions they imposed on, because of the missile issue. Obama also did the same - when Iran had missile tests, they have sanctioned Iran. Trump also did the same. Here, there's no difference. This is issue number one. Number two is the fact that sanctioning Iran has been the core U.S. policy since 1979 revolution in Iran because the U.S. has always had expected Iran to continue to be U.S. allies and Iran has not been ready to be U.S. ally, and therefore it is for 39 years continuously the U.S., in every administration, Republican or Democrat, they have sanctioned Iran, pressured Iran to isolate Iran. We need to wait to see for me practical decisions by President Trump to understand what is the real Trump's Iran policy. SS: Some of the latest sanctions are related to Iran’s ballistic missile programme - why is Iran even pursuing it, what does it need a ballistic missile for? Is it wise to be doing this now, with the nuclear deal hanging in the balance? SM: Look, there's international consensus, the world powers, the P5+1 who have signed the deal with Iran, the IAEA, that missile activities of Iran has nothing to do with the nuclear deal. It is not a violation of a nuclear deal. Here, there's no dispute. However, Trump administration publicly announced that Iran missile test is a violation of Resolution 2231 - the UNSC Resolution 2231. Russia, China, and Europe - they believe it is not a violation of the Resolution 2231. This is only Trump administration. The reason Russia, China, they believe it is not a violation is because, first of all, this is not a type of nuclear capable missile, which Iran has already tested. Second, it says: "calls upon Iran" it means it is an invitation, it is not mandatory. I think neither Trump nor his new team, they have not really had time to read the nuclear deal, the JCPoA, because it is 170 pages, too much technicalities, they might not have time to go through different resolutions - and therefore, they really don't know what they're talking about. SS: US Secretary of state Rex Tillerson is saying the nuclear deal needs a ‘full review’ - but other parties won’t give up on the hard-won agreement easily, so will America go against its partners in this agreement? SM:I don't believe the U.S. would be in position to withdraw from the nuclear deal, or to go for re-negotiating the deal, because it is a deal that took 12 years of negotiations. After 12 years of negotiations, Iran and the world powers, they agreed to a very-very comprehensive deal, which every says: "there's no dispute, this is the most comprehensive agreement during the history of non-proliferation". Therefore, this is a huge achievement for non-proliferation worldwide. The world is not going to go for another 10-12 years of negotiations because the new U.S. administration doesn't like it or Bibi Netanyahu doesn't like it. However, I think, the U.S. would try to derail the atmosphere and the nuclear deal by imposing new sanctions under the umbrella of missile, or "terrorism" or "human rights" or "regional issues" - in order to push Iran to withdraw from the nuclear deal. SS: So you are saying you don't believe that Trump administration's statements... In that case, all this tough talk, is this all a big bluff? SM:I think we have to wait to see the new figures, the National Security advisor, even the high-level diplomats are not yet appointed at the Foreign Ministry of U.S. - we need to wait until the whole team is completely established and then, I believe, they would have to go to read the deal carefully and then to have a better understanding of the deal. However, I still believe the U.S. is not going to withdraw from the deal, they would find other ways. They would try every other venue in order to make Iran angry. Because when Iran cannot benefit, the economic benefits of the nuclear deal, then why Iran should continue to be committed to nuclear agreement? Here is the game, I think, the U.S. would try to play. SS:How will the American credibility hold out in the world if the nuclear treaty is sunk by Trump - how will other countries trust the US to stay true to its word in any other negotiations? SM: It is clear, already, Europe has mentioned very openly that they are not going to re-negotiate the deal, and the U.S. should not withdraw, the U.S. should not violate the deal. Russia has publicly said, China has publicly said - therefore, the international community is united to support the deal. Also, the international community is fully convinced that Iran has complied with all its commitments within the nuclear deal. The IAEA frequently has said that Iran has complied comprehensively with every commitment within the nuclear deal. Therefore, from the international point of view, the deal is working well. Trump administration, if they are going to play with the deal, I think they would make the U.S. internationally isolated. SS: Iran’s President Hassan Rouhani declared : "Iranians will make those using threatening language against this nation regret it." - how can Iran counter American actions? SM: Iran now has good international allies. Although Saudi Arabia, Israel, they are the U.S. allies to undermine the nuclear deal, but, first of all, there's a UNSC Resolution. Second, there's the signature of 6 world powers on the deal. Third, this is the IAEA which 100% is satisfied and is convinced that the deal would prevent any possibility for diversion toward weaponization in Iran. Iran now has a really big advantage of having many-many powerful international partners, include 120 of non-alignment movement, like India, like Brazil, which are supporting the deal. Therefore, Iran now has advantage to use such united international community to confront the U.S. playing with the nuclear deal. SS: Like you've said, during the sanctions era, Iran developed strong ties away from the West - trading with India, China, Russia. Now that the sanctions are lifted, is Iran going to weaken those ties and turn back towards the West? SM: Iran already believed what President Obama did during his term - 10 years extension of Iran's Sanction Act from 2016 to 2026 - Iran already believes it is a clear violation of the nuclear deal. However, every party who disputes violation of the nuclear deal by the other party, has to go to a joint commision already foreseen within the JCPOA to bring its reasons. Iran up to now has not been able to convince the world powers unanimously that the extension of Iran Sanctions Act has been a violation. Russia believes it is a violation, the U.S. has violated the nuclear deal by extending the sanctions. China, definitely, is not happy. Europe is criticizing - however, Europe believes it is not a violation. Therefore, there's dispute between the world powers whether this is a violation or not. However, if Trump is going to continue in the same manner, I believe, then Europe, Russia, China, everybody would be convinced that the U.S. violating the nuclear deal; and, of course, Iran is not going to continue to be committed to the nuclear deal. SS:Iran’s supreme leader Ayatollah Khamenei has said that it’s pointless to have a diplomatic relationship with the U.S. and he is very sceptical about the nuclear talks. Does this mean there are powerful opponents to the deal in Iran as well as Washington? SM: Definitely there was more opponents in Iran compared to Washington. I mean, when I was watching the year of internal fightings in Iran on the nuclear deal, I was also at the same time comparing it with the fights within Washington - I was totally convinced that the opposition to Iranian nuclear deal in Iran, it was much more than in the U.S.. However, under the leadership of Ayatollah Khamenei, although he was sceptical about the deal, but he could manage the country somehow that the Iranian Parliament ultimately approved the deal, National Security Council ultimately approved the deal, government approved, and the supreme leader who is the ultimate decision-maker also agreed. Therefore, the most important security and political establishments of Iran: Parliament, National Security, Government, the leadership - they all agreed. Therefore, from the Iranian side, I believe the deal would be very much sustainable, but Obama was not able to convince the Congress to approve the deal. That's why, still, I believe, the deal is vulnerable, is shaky, from the U.S. side. Therefore, I would not be afraid from the Iranian side, despite of all opposition, I would be afraid about the situation in Washington. SS: So you're not afraid that with the new sanctions from the U.S., this could actually provoke the Iranian hardliners to sabotage the deal at home? Just drop it out of spite? SM: It would provoke, if the U.S. is going to go to use other umbrellas like "human rights", "terrorism", to bring new sanctions. It would provoke. But, Iranians, they are clever enough, I believe, as long as legally the deal is not violated, I don't believe that they would violate the deal. Then, Iran and the U.S., they would be left fighting over sanctions on other issues, like terrorism and human rights, which has been the fighting for 38 years between Iran and the U.S. Everyone knows, the U.S. tried every measure at the highest level, in every Administration, to bring a regime change in Iran. This is not a secret. At the end, after 38 years, Iran is very stable, if not the most stable country in the region, and Iran is very powerful, if not the most powerful in the region. Therefore, the U.S. three decades of regime change policy has already proven to be a failure. Whether Trump is going to continue the same failure - it is his choice. But it is about 3 or 4 decades of a policy which already has been applied against Iran and now Iran suddenly is one of the most if not the most powerful country. All U.S. allies in the region are weak, or failed or vulnerable. SS: The Iranian presidential vote is a few months away - and with many in the country opposed to the deal, will Rouhani’s moderate position and the willingness to engage with the West cost him the presidential seat? SM: It depends on the U.S.' intentions. If President Trump is really ready for goodwill, for respecting Iran, for non-interference, for a real engagement, then, I believe, Iran would be sceptical, but like in the nuclear deal, Iran accepted to go for direct high level negotiations with the U.S. during Rouhani and during President Ahmadinejad. That's why, I believe, there would be a chance for Trump to try engagement policy with Iran in order to manage the regional crisis. SS: Professor, my question was actually about the situation inside Iran and the upcoming presidential vote. How do you think Rouhani will do in light of his friendly approach towards the West? SM: I don't believe there would be important developments in the next 3-4 months to come, before Iranian election. I really don't believe there would be any important developments on Iran-U.S. relations. Americans, they may have one or two more sanctions on human rights and terrorism, this would have negative impact on domestic situation, this, definitely, would not be positive for Rouhani and his cabinet, but it is not really something to determine or to change the domestic discourse and the vote of Iranian nation, if Trump is going to have one or two sanctions. SS: Celebrations of Iran’s Islamic Revolution anniversary turned into a hundred-thousand strong protest against America - complete with burning of American flags and trampling on Trump dummies. Despite the nuclear deal, lifting of sanctions partially - is the Iranian public just as opposed to the US as before? What's your feeling? SM: What you've mentioned about the anniversary of Iranian Revolution - this has been, actually, the same during 38 years. It has not change. We've always have had the same slogan from Iranian side, always we have had the same slogan from the American side. It was Trump administration saying "Iran is the state terrorism, it is the most dangerous country" - they made, also, the same very-very negative threatening slogans. It is from both capitals, and this is not something new. However, we had the nuclear deal, it was definitely one step forward, but in parallel, when the nuclear deal was signed in July 2015, since then we had about 80 legislations proposed by the U.S. Congress for sanctioning and pressuring Iran. Therefore, Iranians are looking more to the U.S. actions rather than official statements. They believe the U.S. hostile policy has continued regardless of the nuclear deal. Therefore, they are not going to change their policies unless the U.S. changes policy. SS: Iran is one of the main forces backing the fight against ISIS in Syria and Iraq. Is the American administration's confrontation course with Iran actually good news for ISIS? SM:No, definitely, this would be... If Iran and the U.S. they start to confront each other in the region, this would be the best news for ISIS. This would be the best gif for ISIS, because, as you said, Iran is one of the key forces in the region, fighting ISIS in Iraq, in Afghanistan and in Syria, even Al-Qaeda in Yemen, Iran is fighting them. If the U.S. is going to weaken Iran's regional influence and fight against ISIS - practically, the U.S. would help ISIS and ISIS would be very much happy. I hope this is not going to happen, this would not happen. I hope Trump would go for a type of coalition-cooperation with the very successful axis of Russia, Iran, Syria, Iraq on war on ISIS. SS: What outcome would Iran like to see from the conflict in Syria? SM: Iran wants the total integrity of Syria, Iran is totally against the disintegration of Syria, Iran does not want the terrorist or very extreme groups to rule Syria. Iran is supporting power sharing, Iran is supporting free elections by the Syrian nation to decide about their Constitution and the new next president. However, what Iranians believe is first to clean Syria from terrorists, fight ISIS. Then, to go for a new political solution like power sharing, the rights of minorities, the will of majority should rule the country through a free election. Iran is totally ready to go for such principles. SS: Professor, thank you very much for this lovely interview, we were talking to Hossein Mousavian, Former head of Iran's Foreign Relations Committee, veteran diplomat, talking about the future of Iran's nuclear deal and if there's a way forward Iran and the new American administration. That's it for this edition of SophieCo, I will see you next time.